As promised I am able to follow up on my semester readings. I’m still reading, but due to my schedule and the ILL due date for Delete, I needed to focus on Delete first and then move on. First a confession. I did not read the entire text. That is why I titled this entry Impressions and not Book Review. 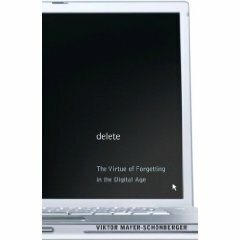 Mayer-Schonberger’s principle argument is that humans, culture, society has been built up around the simple fact that it is easier to forget than to remember. We’ve established systems that help us remember the important things or things that we believe will be important. The very act of selecting what to remember acknowledges that we will be forgetting something. As a librarian I frequently ponder this reality. One of the library’s principle roles is to preserve knowledge. I’ve had many a cocktail conversation about how libraries go about selecting which knowledge to preserve and how impossible it is for one library to preserve all knowledge. In the early days of the Internet librarians fretted about how to preserve fleeting web pages. [Here’s an example of a current archiving project.] We librarians, and as Mayer-Schonberger points out most of us, are striving to preserve more – not less. We feel that more information should lead to better choices, better life, better society for all. It seems counter-intuitive to suggest the opposite. But that is exactly what Mayer-Schonberger does. He provides examples of where too much information led to poor choices, unfair treatment, or otherwise unfortunate consequences. Other bloggers have found his examples to be weak or lacking. To an extent I agree with them. But the examples call attention to his concern about self-censorship in light of a digital world where forgetting is not an option. When Facebook was first becoming popular my husband created a persona- complete with wig and bogus interests. He and his friends were still enjoying the anonymity that virtual worlds allowed. It quickly became obvious that this information could be traced back to him and did he really want his future employers, colleagues seeing this information? No. So he deleted the account. Self-censorship. Or as I like to refer to it: self-authoring. Mayer-Schonberger is right to caution against a society where individuals feel that they need to censor themselves as a measure of protection. So he has suggested strategies or policies that could be adopted to enable digital systems to forget. I can see the usefulness of something like an expiration date for medical records or prescriptions or traffic violations. But when it comes to our personal data, information that we share in social networks or websites, I believe that individuals, not systems, should be responsible for managing their own records. Students should be learning about the importance of self-authorship and implications of digital information in school as part of a larger curriculum on information literacy. Just as we learn the art, skill, and techniques of communicating in written word and orally, in interviews and in academic papers, students should be learning how to do so responsibly in the digital world. The current assumption among students is that only their friends care about what they write in Facebook. But as Mayer-Schonberger points out that is a false assumption. But I think it is an evolving one. In five or ten years there may be laws in place to protect us from discrimination based upon information about us in social networks. But even with such laws in place there is still the issue that once someone knows something they must work hard to unknow it. So in the end Delete: The Virtue of Forgetting in the Digital Age affirmed my personal stance against Facebook. Facebook is not part of my self-authoring tools because I don’t feel like I can assume the level of control that I am most comfortable with. My other reading, The Young & the Digital, may give me some good reasons to reconsider the social benefits.